Overflowing a tank is the number one cause of spills. Spills that seep into the ground or escape down a drain can have massive price tags attached to the clean up. 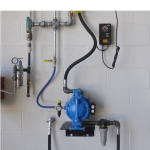 Most overflow prevention systems cut air to the supply pump when the tank is full. Consider this: A Tech with a car on the lift is in a hurry to get a drain emptied. The drain evacuation pump stops and the air pressure drops to zero. Without thinking the Tech grabs a nearby airline to get the pump running again. In his hurry to finish the oil change he unknowingly overflows the used oil tank. Another scenario: The Tech hooks up a drain and starts the pump. He steps out to have a cigarette while the drain empties. The tank is full and the alarm goes off but he can’t hear it. While leaving for lunch, the Parts Manager sees oil spilling from the top of the tank. He stops the car, runs into the shop and shuts the pump off. Both are actual stories that happened locally! The only fool-proof way to prevent a tank overflow is to physically close off the tank’s inflow pipe. 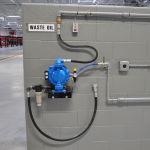 When a tank reaches a high level condition, the Eliminator automatically shuts the valve on the inflow pipe, sealing the tank and making it impossible to overflow. The valve won’t open and admit oil into the tank until the oil level has been lowered. The system is fully automatic and cannot be overridden by a technician. It works on all size tanks, with any number of pumps and any fluid. Eliminator takes the unique approach of protecing the tank by sealing it off so it cannot recieve any more fluid. Other systems work by shutting off the pumps but leaving the tank open. This method leaves open the possibility of an overflow should a pump or any other source send oil toward the already full tank. [For instance, a large header will continue sending oil to the tank even after the pump has been shut down] A feature important to the success of the Eliminator is the use of status lights. At each station the operator will see a light indicating if the tank is full and not accepting oil (red), nearly full and will need attention soon (yellow) or wide open (green). The status lights eliminate two of the largest shortcomings of other systems by providing the operator 1.) a warning that the tank is nearly full and may stop accepting oil and 2.) that the tank is full and is no longer accepting oil. The fluid level gauge on a remote tank does nothing to inform the operator of the tank’s status. By sealing off the in-flow pipe YOU MAKE IT IMPOSSIBLE TO OVERFLOW A TANK. It just isn’t possible to have an overflow when there is no way additional fluid can enter the tank. This simple and unique approach is what earned Eliminator the title of world’s best tank overflow protection system. At the heart of the system are the Smart Console and the Automatic Valves. The Smart Console takes signals from the tank floats, operates the indicator lights and during high level conditions, activates the Automatic Valves. The air operated Automatic Valves shut the tank tight, providing a positive seal against any oil trying to reach the tank and overflow it. A popular application for the Eliminator is managing multiple tanks used with oil heaters. 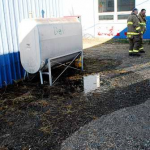 The primary storage tank can be placed outside or wherever you have space. A small day tank is placed inside near the furnace. Throughout the heating season the Eliminator tranfers small amounts of oil from the main storage tank to the day tank, allowing it to warm up prior to being burned by the furnace. The Eliminator provides overflow protection for the primary storage tank and also tops up the heater tank automatically, ensuring your furnace has a continous supply of warm oil.